Game night? Burgers, bratwurst and buns? Oh my! 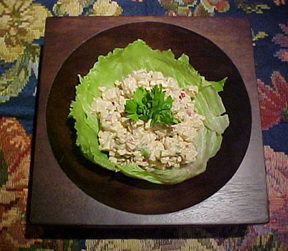 Challenged to bring a suitable side for such hearty fare, I turned to an old classic: potato salad. Here’s a yummy update of a traditional favorite, made universal with good ole’ BACON! Whether your game is real or virtual, you’ll want to keep this recipe in your corner for that last, delicious play! To prepare Bacon and Onion Yum Yum: Slowly brown bacon in olive oil over medium-high heat. When bacon begins to color, about 3 minutes, add onion, garlic, and bay leaf. Add sugar, salt and pepper, and saute gently. Reduce heat to low, and let onions caramelize, about ten minutes. Stir occasionally, taking care to not let onions burn. Remove from heat; remove bay leaf and discard. 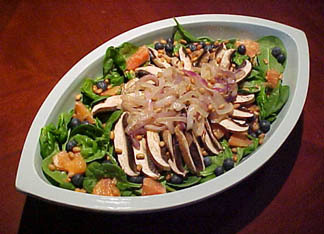 To prepare dressing: Whisk all ingredients together in a medium bowl. 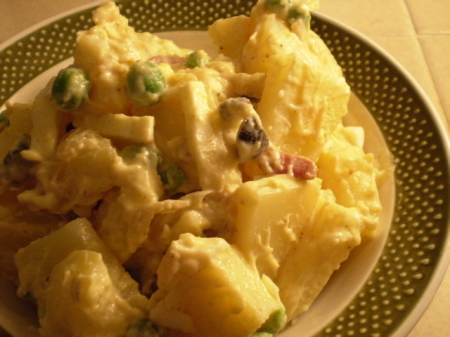 To prepare salad: In a large bowl, combine sliced potatoes, eggs, peas and olives. Toss gently to mix. Add bacon and onion mixture, and toss gently again. Add dressing, and gently fold in, taking care not to break up potatoes. Chill at least 2 hours. Toss once more before serving, checking seasonings.